I’ve stated before I’m not a big fan of resolutions. That said, I do like looking back over the year and seeing what I have accomplished (or not!). 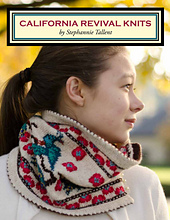 The biggest news, for me: California Revival Knits came out! I’m so proud of it. It’s garnered some really wonderful reviews — Knitty, Vogue, various podcasts to include Knit 1, ♡ Too & The Knit Girllls. Scroll down to the bottom of this page to see some of the reviews. Kathy Cadigan did absolutely gorgeous photography (that’s her lovely daughter Morgan on the cover). Kathy is just so talented, and I’m so lucky she did the photography. And as I’ve learned this year, the work doesn’t stop once it’s in print, lol. I’ve done a few trunk shows and book signings (everywhere from here in Los Angeles to Chicago! ), and am planning more for 2013. For example, I’ll be doing demos and displaying projects from the book Saturday February 1th at Madrona. I also published Autumn Nostalgia for the MFPP in September. It’s a nice mix of projects — stranded mitts (TailGate Mitts), cabled cowl (Applejack, shown on the cover, left), and textured cardi & hat (Farewell Summer). Fresh Designs: Men came out — my Abalone Cove hat pattern, a fun honeycomb cable variation hat (which can be worn by women and kids as well! ), is included. I’ll be posting a few more pics when I get the sample back to really show off the cables. I did the Byzantine Cowl for Kate at Dragonfly Fibers. It’ll be coming out this year in my Ravelry store & through Deep South Fibers. The Lagniappe Mitts & Cuff pattern is the pattern I use for my beading class. One more new pattern this year was published — the fingerless version of Ravens in Snow. I don’t really like to go back & redo patterns (too many new things to work on! ), but I wasn’t done with the Ravens stitch pattern. I love how these fingerless mitts turned out! 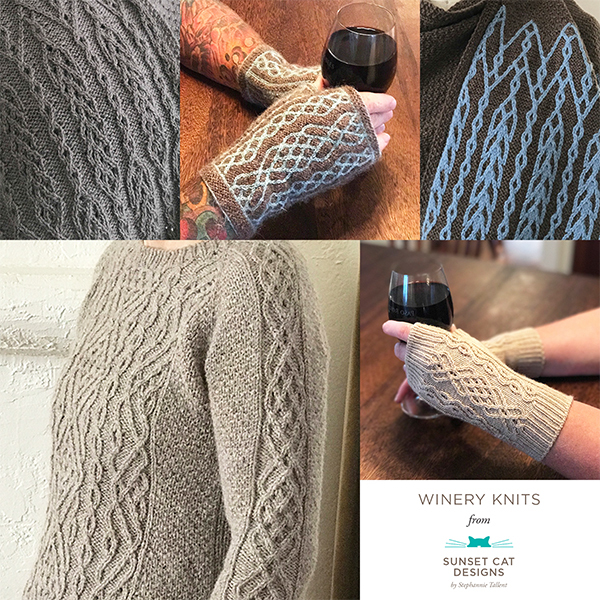 What I can’t show are the designs for the next book; the four designs I did myself for Hitch; the design I did for an upcoming DeFarge book; the socks & mitts for the Cooperative Press sock club (coming soon! ); and the designs to be released later this year for a yarn company (two of which I finished, the third I’m still working on). Oh, and Hitch? It morphed from being a small ebook done by yours truly, to a 30 pattern collection created by a plethora of incredibly talented designers, curated by me. We’re in the final bits of tech editing before it all goes to layout. I also taught at Madrona; taught beading at Knitculture here in Los Angeles; visited Rhinebeck, Stitches West, & Stitches Midwest for book signings; and attended TNNA in the winter in Phoenix and summer in Columbus.